After a wonderful experience at the Quantified Self Conference in Amsterdam earlier this year, my expectations for the Global version on the big stage in San Francisco were quite high. The program looked very promising and with the arrival at the beautiful Golden Gate Club in the Presidio of San Francisco, I couldn’t wait for it to start. Nothing for passive listeners, go mingle! 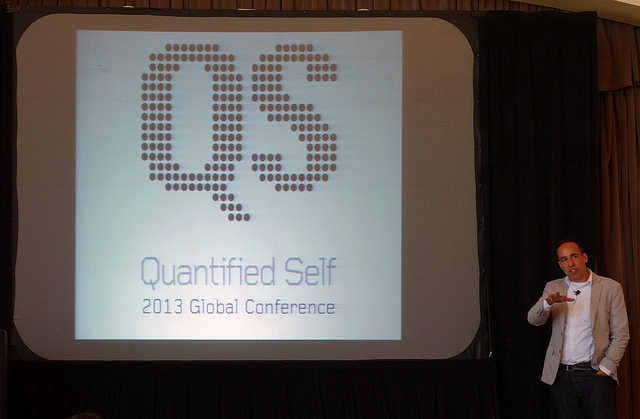 The event was set up in conventional Quantified Self format with many simultaneous sessions. Next to the Plenaries, there were Show&Tell Talks, Conversations, Breakouts, and Office Hours providing lots of information to be shared during the frequent breaks. With all this material floating around, QS events come to life in the exchanges with others. Anyone just sitting in and passively listening would have a hard time getting his or her money’s worth. The first talk that caught my attention was given by Ian Eslick on “Doing Great Personal Experiments.” Ian contrasted clinical research with self-experimentation and highlighted the significance and value of both. Even though personal experiments might be flawed and statistically insignificant on a clinical level, they still might carry very important personal significance for the individual. Meeting Linda Avey, Co-Founder of 23andMe and Curious, Inc.
My spit hasn’t found its way into one of 23andMe’s tubes yet but I am very intrigued by the powers of genetic testing. The company offers an affordable genetic screening that provides individuals with reports on their inherited health conditions, traits, and lineage. Linda then left the company in 2009 and established Curious, Inc., a platform that allows people to analyze and interpret their personal data and share it with their community. I was excited to discuss the combination of biomarker and genetic testing with this impressive and very approachable entrepreneur. One of the funniest talks was given by AskMeEvery’s Mark Moschel who overcame his fear of rejection by… well… getting rejected every day for 30 days straight! During this month of social challenges, Mark confronted people with mostly silly questions such as if he could borrow money from a grocery store clerk to if he could visit the storage facilities of a warehouse. Even though Mark noticed a sharp increase in confidence during the 30 days, the newly won courage almost dropped to the starting point shortly after he had stopped the experiment. Highly entertaining was Kitty Ireland’s exploration of her grandma’s diary from 1942. Her grandma Pat painstakingly maintained a diary where she logged everything from meals she consumed, locations she frequented, and (quite a few) boys she had dated. Kitty then correlated her findings with patterns in her own life and identified several parallels. As engaging as this detailed look into a past life was, we were spared a happy end. Grandma Pat’s apparent partner of choice, a guy called Zip as highlighted decoratevily on several pages, disappeared from the log after some time. 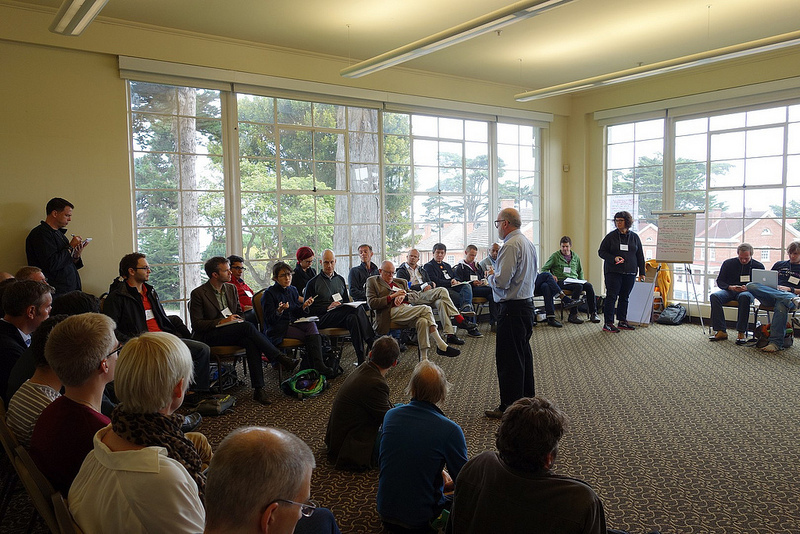 Most breakout sessions that I attended were either too crowded or too disorganized, or both. However, the session “QS in 10 & 100 Years” by QS co-founder Kevin Kelly had some very interesting visions of the future of QS. When everything we do is tracked and measured, we might become civilian scientist of our own biology. Our environment would then react to all of our immediate needs: sensors will tell us at all times when we should eat, run, sleep, work, and socialize to optimize our well-being. The information would then be shared with friends and families but also with doctors, employers, and insurance companies. A world of endless possibilities for easy self- enhancement might then turn into a scary rat race with wellness and privacy as a currency. The healthier and more transparent you choose to be, the less you pay. 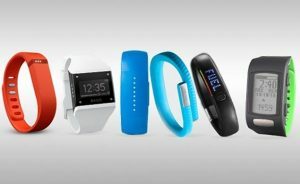 Someone even proposed that instead of reading about Forbes Magazine’s wealthiest people, we might find a list with the world’s biggest “healthionnaires.” Another fascinating vision was an overly transparent, technology-ridden world with black markets for sensor-free clothing and under-the-radar items. What a wonderful feeling to get positive feedback on what you’re working on from one of the field’s greats. Dave Asprey, supposedly the first person to ever sell anything on the internet, cloud computing expert, long-term biohacker, and founder of The Bulletproof Executive brand, really can be considered a pioneer in the field of QS. When I presented him with my idea for Biotrakr, a web-based and intuitive health coach that provides personalized health recommendations based on biomarker diagnostics, Dave was intrigued and shared with me some of his learnings as an advisor for WellnessFX. Moreover, Dave called Vitamin D the “most important biohack” and described eagerly how he prepares and smokes his own bacon at his home on Vancouver Island. In comparison to Amsterdam, I really liked that we had a separate room for companies showing off their newest gadgets this time. And there were many very cool ones! It’s been only a couple of weeks now that I’ve received my UP band replacement (as in so many other cases, it broke after about 3 months) and restarted tracking my activitiy and sleep… Activity and sleep? How basic! AIRO is now working on a spectroscopic tracker that not only tracks activity and sleep but also stress levels and calorie intake. Automatically! Preleminary release is set for the end of 2014 so we’ll have to wait a bit. OMSignal is definitely making some noise. They just took home the DC to VC People’s Choice Award at the Health 2.0 conference in Santa Clara three weeks ago and they also were one of the major attractions at QS 2013. Their prototype shirt allows continuous tracking of biometrics by monitoring heart rate, breathing, and activity. The consumer can then display the data in real-time on a mobile phone. Amazing, how the Finnish constantly come up with great ideas in the QS space. Ambro is only one out of three of my personal highlights (the other two being Beddit and Health Puzzle’s app YOU). What I really like about Ambro: they don’t claim that you can entirely live on it like their most famous competitor Soylent does with its product. Instead, they offer a highly nutritional drink for the occasional cooking inertia. The team around Lasse Leppäkorpi had presented its sleep tracking sensor that is placed under the sheet already in Amsterdam. This time, I had the chance for a lengthy conversation with Lasse about the origins of the company six years ago, it’s takeover of the ZEO team along the way and its upcoming move to the Valley. Subscribe here for updates, sleep trackers! There were plenty more captivating ideas, apps, concepts, and services that I’m not going to list. If you want to find out more, visit some of the other blog articles on the conferences listed below. I also added a link to a youtube video of the talk by Zipongo, a company that makes personalized healthy meal plans based on your eating preferences. Did the event eventually meet my expectations? Right after the event, I wasn’t sure. It didn’t flash me as much as my first QS conference. But now, after gathering my thoughts and looking over my notes, I say: definitely! There certainly were aspects that can be optimized such as the temperature (it was freezing inside), the organization of some of the sessions (a simple agenda would suffice), and the coffee refills (ran out several times). Other than that, hat’s off to the organizers! I hope to see all of you in Amsterdam next year! On a side note, I loved the healthy, organic, gluten-free, vegan snack bars as well as the large plates full of cooked eggs! Final words: turn up the heat and see you in Amsterdam!